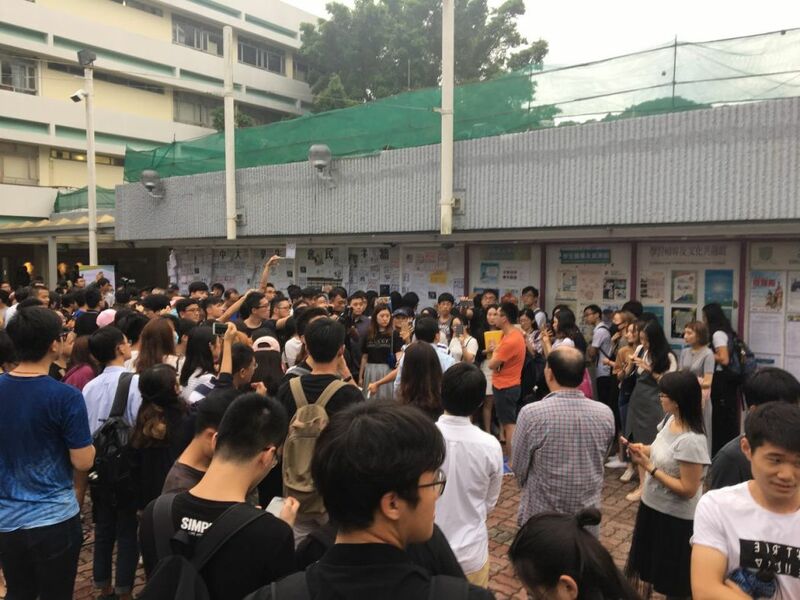 Local and mainland Chinese University of Hong Kong students (CUHK) confronted each other on Thursday over the recent row on pro-independence posters and banners on the Sha Tin campus. 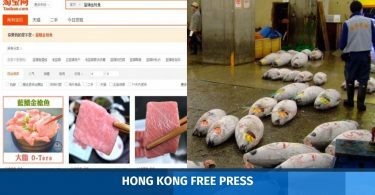 It prompted the university’s Vice-Chancellor Joseph Sung to claim that the “idea” of an independent Hong Kong was unconstitutional. 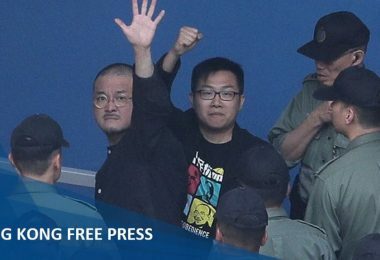 Multiple banners were spotted at CUHK on Monday before they were removed by the school, which said it does not support independence and falsely claimed the debate was unlawful. Other universities’ student unions lent their support to their CUHK counterpart. Anti-independence poster at CUHK. Photo: InMedia. 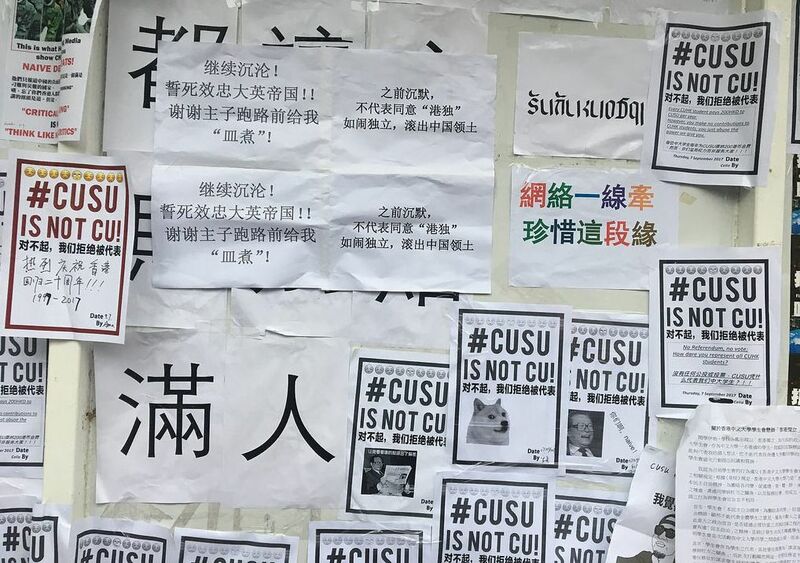 Following the removal, the Chinese University student union message board at the Benjamin Franklin Centre’s Cultural Square, managed by the union, was filled with pro-independence posters. The union arranged for executives to guard the posters from being removed. On Thursday afternoon, the student union agreed on a compromise to remove “oversized” posters in order to respect the diversity of comments and fairness, and to allow other students to paste up posters. It also noted that the rules for the message board state that students cannot cover, remove, or deface other people’s posters, thus it moved posters which covered other messages to an appropriate position. 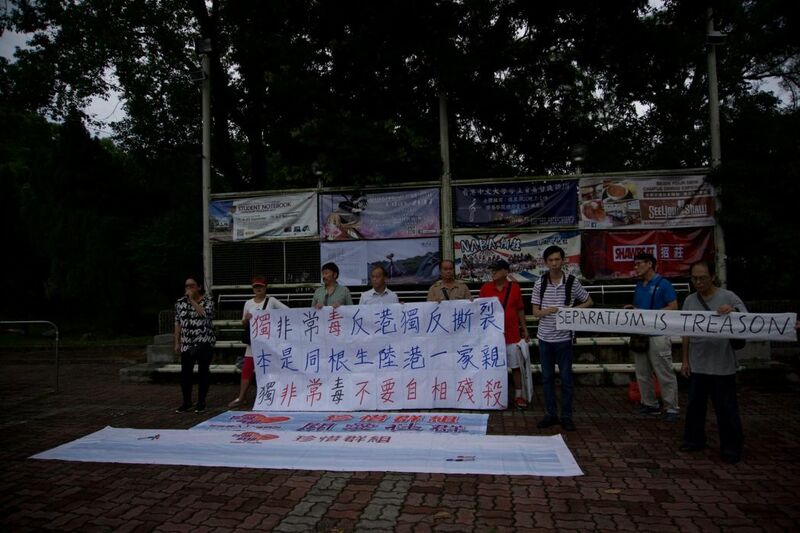 Mainland students have called for a rally at the square to post anti-independence posters as a response. At around 5:40pm, some CUHK mainland students arrived and put up posters saying “CUSU [Chinese University student union] is not CU” on the wall. Videos of arguments between students have circulated on social media. But both groups peacefully dispersed after around an hour. CUHK Vice-Chancellor Joseph Sung said he has been kept informed of the recent controversies although he was attending an academic conference overseas. “The idea of an independent Hong Kong is not only in breach of the Basic Law of Hong Kong but also contrary to what I personally believe. 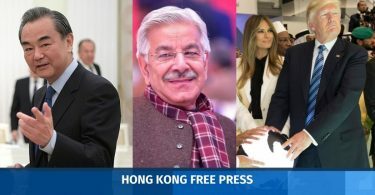 Hong Kong is an inalienable part of China; this is beyond dispute,” he said in a statement. The “Treasure Group.” Photo: Chinese University Student Press. Also on Thursday, around ten anti-independence protesters from the “Treasure Group” arrived at the square, engaging in a quarrel with students. However, they were separated from students by security guards before leaving.